Children are the most lovable and adorable gifts to parents. They trigger so many emotions in our lives makings us cry, smile, laugh, jump and even stay shocked at times. 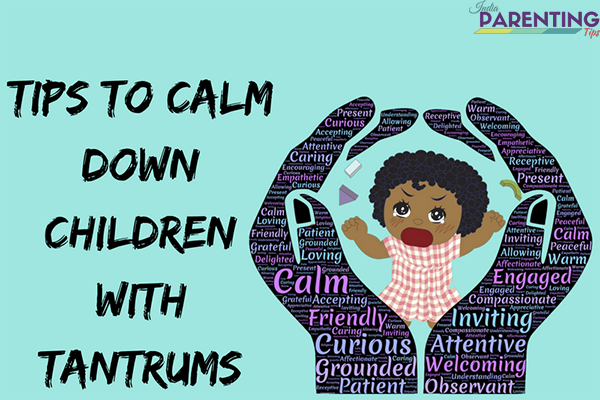 However, with these unfiltered outbursts of so many feelings, children often go wild with their tantrums that leaves parents bewildered and stressed to find ways how to calm children with tantrums. Temper tantrums are common amongst children across all ages. For younger children between 1 and 2 years, it occurs at least once or twice a week. By the time they turn 3 or 4 their vocabulary is still not enough to express their feelings and they often become cranky and very difficult to handle. This continues until they are at least 5-6 years old. We have heard about angry birds, angry moms but angry babies are not something that we hear it quite commonly. Neither there are any anger management classes for them nor any counseling sessions would do any good at this age. However, there are definitely great ways which you as a parent can adopt and master the art of easing out the aggression. Children often throw tantrums when they do not know how to express themselves. The only way they can grab your attention is to act cranky. Try to understand the reason behind whining and neutralize that. Ensure that you are well prepared before you leave your house with your kid with stuff that he or she feels comforted. It could be his or her favorite toy, a blanket, some snacks he or she likes. Whatever comforts and calms the child should be available. It is not about letting your child choose which house to live in or which insurance policy to buy for your car. It is about making him feel free to choose what he wants first. This way your child will be able to decide for himself or herself, take responsibility for the consequences of his or her decision. Example: When he wakes up you may ask him if he wants to brush first or change first. Eventually, he or she would need to do both but letting him or her choice to select gives a sense of independence and freedom that every child enjoys. For instance, he or she might choose to change clothes first and then brush their teeth. Eventually while brushing their teeth or cleaning face he or she might get his or her shirt wet that might need a change again. That’s the consequence of his or her choice and let him or her understand that rather than being told. There is always a reason behind everything. Nothing happens out of the blue. We need to have the vision to realize that and act accordingly. 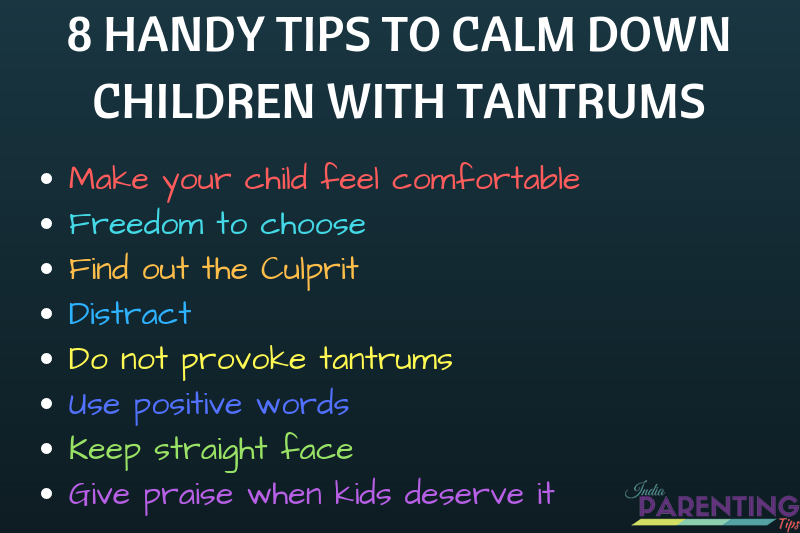 Try to find the culprit behind 8 Handy tips to calm down children with tantrums. Is it the food? Is it your attention? Is it for stomach pain? An easy way to find this out is to teach your little one sign language when he or she is yet not able to talk clearly. Teach simple sign language of food, milk, sleep, stomach pain, hugs, kiss and so on. You know best when your child goes wild. So whenever he or she shows the first sign on throwing tantrums, distract him or her. Just do something that grabs the attention and makes him or her forget. It could be some funny actions, some joke, a nice story, a song, music he or she loves, a funny dance that makes him or her laugh and many more. If there is something that you now that bothers him or her push that thing away from him or her. If there is something that you know that your baby would nag and throw tantrums to get it and you do not want him or her to take it for whatever reason, please keep that stuff away from your child. Remember not to mock him or her or make fun of him throwing tantrums. This irritates the child more. Stay calm and keep the place free from things that might trigger tantrums. No matter how hard it is for you to handle your difficult child, never be rude and mark every word you say. Words are powerful weapons that make or breaks people. Remember not to hurt your child with your words that might come out of your frustration or anger. Wow! You did a great job. It is not that you need to listen to every demand of your child. That way you would spoil the child more than doing any good while trying to avoid his or her tantrums. Let him or her understand that no means no. However, provide alternatives. Like No you can't have the ice cream now. But I can get you a candy for listening to me. Another great tip is to introduce a warning sign to the child with your body language and make him or her realize that you would stop listening if he or she starts shouts or behaves wild. Remain calm and keep your face straight without showing any reactions. Some parents feel very awkward and shy to praise their own kids while they go bragging about how well behaved the neighbor's daughter is or how talented their first cousin is and so on. When it comes to their own child they often shy away from saying any words of praise as if it is self-boasting. This is wrong. You need to praise your child genuinely for their good deeds or actions. This does not mean false praising. Praise when you need to praise. This would indeed help foster personality development for your child. No two children are the same and every child is unique and so every parent and every family. Apart from the helpful tips discussed above, there could be a lot more than you could do for your family that might work as wonder. If your child’s tantrums and aggressive behavior are seriously causing problems in your family and lifestyle, then perhaps it would be a good idea to talk to a health care professional and get help to work things out more effectively.